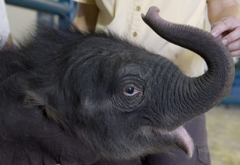 He’s just twelve hours older than the presidency he’s named after, but the Ringling Brothers’ newest Elephant calf is named Barack. While the President might rather have a few donkeys named after him rather than the traditional mascot of the Republican Party, it’s nice to see another endangered species add some numbers to their herd. I suppose you could make some sort of joke about similarities in parentage, as currently, the Elephant Center isn’t sure which of their donors was the father just yet. But that would be in poor taste. So we won’t make that joke.